This week I have been running like a chicken with my head cut off, seriously. My oldest daughter has been practicing all summer for her role in the play called "Godspell." Our church is very involved in Community Player's and decided to make this an all youth play. Needless to say, the play has been an awesome experience for her and the performances are this week. To top it off, I signed her up back in May for a cake decorating class at our local community college. It just so happened the classes and the performances fell on the same week. We have been running to class and church and oh I forget to tell you, softball try-outs are this week too. What do they say about God never gives you more than you can handle! Um, I'm there. 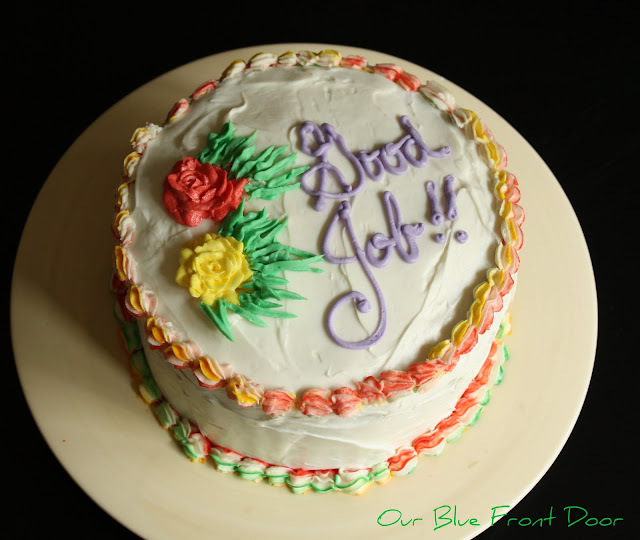 I am proud of how well she's handled herself this week and wanted to show you what she made at the end of her cake decorating class. She was so smart and decorated her cake to take to the potluck at the end of the play tomorrow. 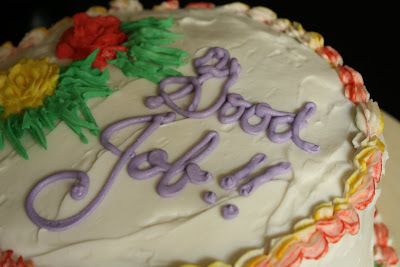 She decorated the entire cake herself with a little help on the Good Job from her instructor. I was impressed with what she learned this week and how well she did. We now have a cake decorator in the family. She was especially proud of the flowers she made all by herself. The colors are beautiful! She used several colors to make the boarder, so creative. I'm impressed how she kept her line so symmetrical. Can you tell I am proud of her? Her inspiration, the one and only Cake Boss. She watches every episode and even DVR's it so she doesn't miss anything. 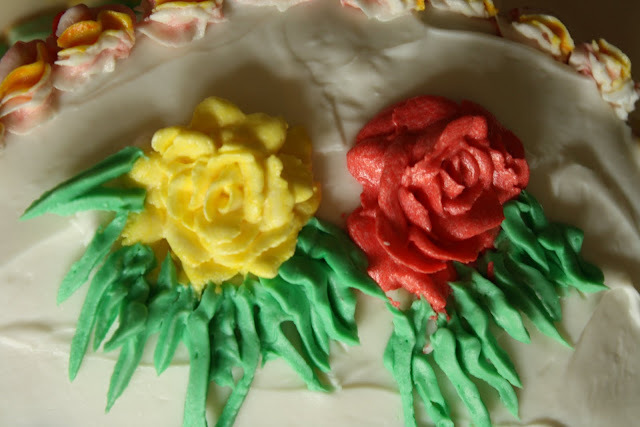 She wanted one of his cakes for her birthday this summer, but it didn't happen. You never know maybe someday she'll have her own bakery. Have you had one of these weeks this summer? I love the cake! Your daughter did a wonderful job decorating it. I also watch the Cake Boss. He's the best!!! WOW, yummy, It looks so pretty to eat. Your daughter is talented. Thanks for sharing with the newbie party. I'm very impressed!! She did a great job. She did a fantastic job and I love the multi colored icing! 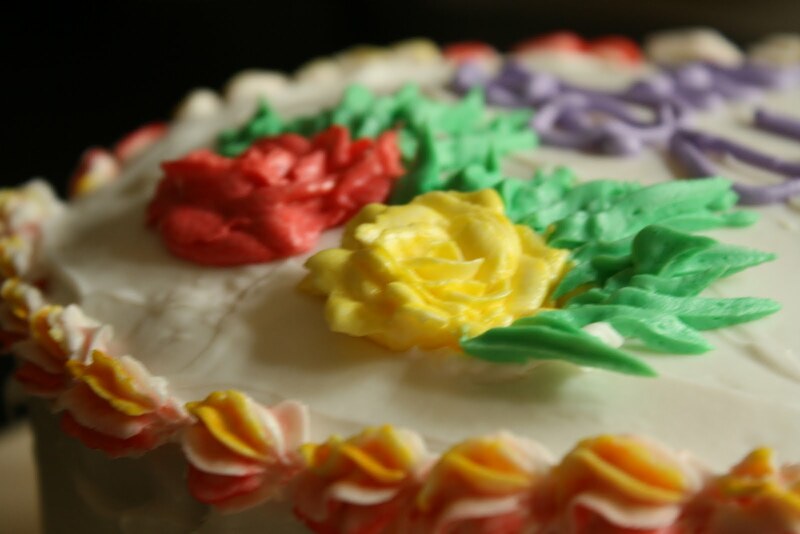 It's terrific to have a cake decorator in your family! 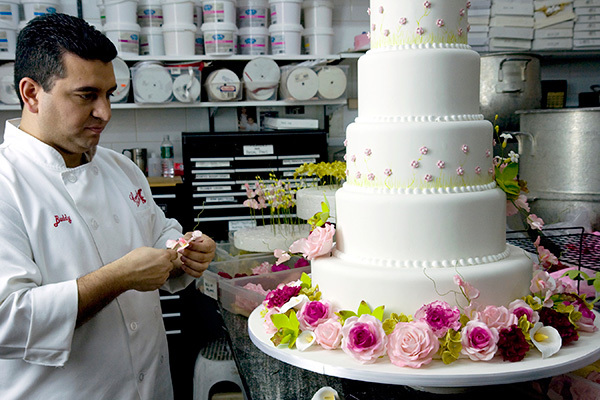 We all love Cake Boss, too! Did you wish you could clone yourself last week?